A dentist called Walter Palmer has killed a lion called Cecil. Cecil the lion is now dead, and never has the world been so united in grief. Well, perhaps not since the death of Diana, Princess of Wales. But for the death of an animal, the global outpouring has been extraordinary – hysterical, even. 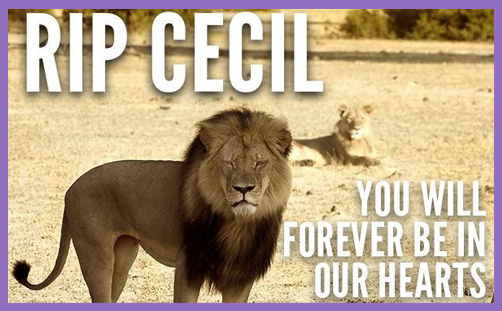 RIP Cecil – you will forever be in our hearts. Walter the dentist is from Wisconsin. Cecil the lion was from Zimbabwe. Walter seemingly paid $50,000 for the pleasure of killing Cecil, though it isn’t clear who granted the permit. Perhaps it was illicit, but Walter wasn’t to know. He went in search of exhilaration. He just wanted to hunt and bag a trophy. It beats filling teeth. But now Cecil the lion is dead. He was shot with a crossbow, then beheaded and skinned. No doubt the head is off to the taxidermist, destined to gather dust on someone’s wall, and the skin will be stapled, stretched, salted and cured, eventually to grace the floor of a safari-themed bedroom, or perhaps a hunting cabin in Dallas. Hunting is a coward’s pastime. If, as has been reported, this dentist and his guides lured Cecil out of the park with food so as to shoot him on private property, because shooting him in the park would have been illegal, he needs to be extradited, charged, and, preferably, hanged. To get a thrill at the cost of a life, this man gunned down a beloved lion, Cecil with a high-powered weapon. All wild animals are beloved by their own mates and infants, but to hunters like this overblown, over-privileged little man, who lack empathy, understanding, and respect for living creatures, they are merely targets to kill, decapitate, and hang up on a wall as a trophy. So, Walter the dentist must be hanged for shooting Cecil the lion. Notwithstanding the fact that 23,000 African elephants were killed for their tusks last year, and 1004 African rhinos were killed for their horns. And let’s not talk about shark-fin soup; or the puppies burned and boiled alive to be served with chow mein; or the 50,000 greyhounds hanged in Spain every year for no other reason than being slow hunters. In England, a dog is man’s best friend. In China, it is dinner. In Spain, it is tree decoration. But Walter killed Cecil the lion. Cecil had a name; an identity. Cecil the lion was loved, and so must be properly mourned and buried with dignity, if not a fitting liturgy. Man is free to participate in the order of creation by knowledge and action. But he must both know and act. How can man kill without compassion? How can he consume without conscience? There is an order of creation, and man is at the pinnacle, made in the image of God. But he is unique in the application of moral inquiry. If a prawn cannot sin, how much more perfect is the nobility, dignity and character of a lion? Should it not be left free in its potency and possibility to proclaim the glory of God?